Do comics filled with sterile smiley faces, bloody amputations and recycling babies, and a dash of humour excite you? How does being in the same room as like-minded individuals and admiring all sorts of brutally funny images sound, then? Symmetry Entertainment and THE ARTBISHOP are proudly presenting Joan Cornellà‘s debut solo exhibition right here in Singapore this month. 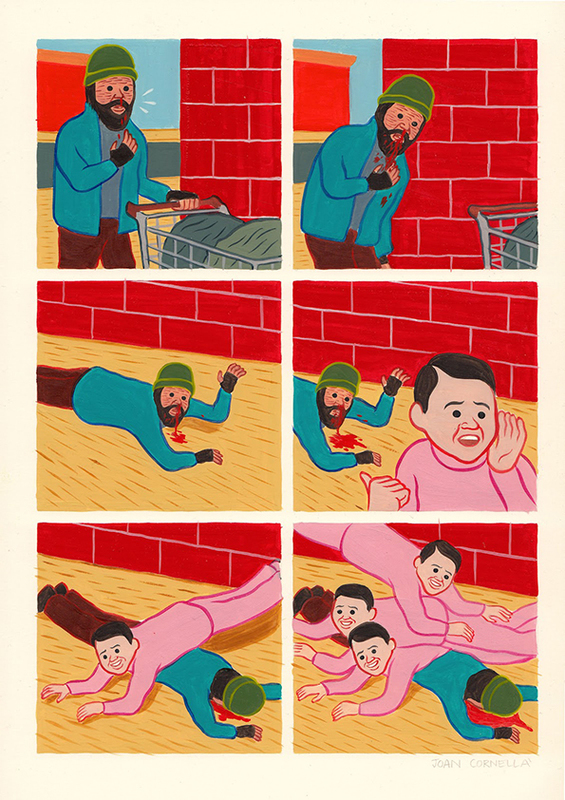 Joan Cornellà is a well-known Spanish cartoonist and illustrator based in Barcelona. Known for his wordless, bright and bold six-panel comics, they often offer glimpses of introspective dark humour and cynicism. Cruelly captivating and unique, his childlike aesthetic style appeals to the masses. One is able to find his works easily through the net, especially on social media sites such as Tumblr. Held exclusively in Hong Kong and on our local shores, this makes us the only Southeast Asian stop on this tour. This exhibition will open over a 10-day period over at Far Out!, their official venue partner. This is one chance to get close to the artist himself, as well as view the original works, purchase limited edition prints and so on.